MacMullan has six lodges for overnight accommodations and nine classrooms. The center can sleep up to 135 people each night. The conference center also maintains 660 feet of beachfront access for swimming and fishing, as well as such amenities as volleyball, horseshoes, shuffleboard and basketball facilities. What might MacMullan sell for if it were sold openly on the market? It is impossible to say precisely, but a comparative analysis can give us a general idea. Coldwell Banker is currently listing 7.4 unimproved acres on Higgins Lake with 460 feet of frontage for $2.3 million. MacMullan has four times the acreage and almost one-third more lake frontage. The state could reap $10 million. Savings: $1,266,600. The state of Michigan owns and operates a series of state parks. User fees do not cover the cost of operating these facilities. User fees could be set high enough to cover the cost of running these parks without state subsidies. In the past five years the state parks have generated an annual average of 64.3 percent of their operating dollars. A change in law would be necessary to remove the current statutory requirement that there be a GF/GP appropriation at least equal to the fiscal year 1994 appropriation, plus adjustments for inflation. The resulting fee hike should generate an additional $25.2 million annually. Revenue enhancement: $25,280,155. This appropriation funds recreational boating programs in the state of Michigan. It is composed of two distinct programs. The first is the “Public Access Site Program.” The second is the “Docks and Harbor Development Program.” Below are descriptions of each. The state currently oversees a network of 81 marinas and harbors designed to protect boaters from the elements or other emergencies. The goal of the state is to ensure that boaters in trouble have no more than 30 miles between safe harbors. It has developed this network through various funding mechanisms including a) direct state aid; b) grants and aid from other levels of government; and c) public-private partnerships whereby private developers build and manage harbors under a long-term lease arrangement with the state. Public Access Site Program This program allows the state to “acquire, develop, operate, and maintain properties to provide access to the Great Lakes, inland lakes over 100 acres in size, and navigable rivers and streams for boating and recreational activities.” The Parks and Recreation Bureau, which oversees this program, manages more than 700 boat-launching facilities across the state and has subsidized the creation of more than 400 others in concert with local units of government and “other Divisions within the Department.” The state often partners with private-sector businesses or groups to develop and maintain sites under long-term lease arrangements. Docks and Harbor Development Program This program is designed to encourage “tourist-related” economic development by assisting with the development and operation of harbors and docking facilities for recreational boaters on the Great Lakes shoreline. There is not a large difference between this program and the Public Access Site Program, above. Both the Public Access Site program and the Docks and Harbor Development Program should be eliminated. Total responsibility for building boat launches, marinas, and harbors should be devolved to the local governmental unit (counties, villages, townships or cities) in which they reside. Management and construction of such sites is nothing new to local governments or private developers. If a new marina, harbor, or boat launch site is of value to the area the decision to fund it should come primarily from the local government or private investors who stand to gain the most from it. Once the state devolves its ownership of such facilities to local units of government, those units should be free to privatize as they see fit. Privatization of such operations is nothing new. In 1986 and prior, the Ecorse boat ramp was managed by city employees and lost about $25,000 annually. The city outsourced launch management to a private firm. The result was a $50,000 turnaround. Not only was the city no longer on the hook for subsidies, it began receiving $25,000 in additional revenues generated by the site. The large number and size of these facilities suggests that a careful analysis be made by state officials as to what would be the best way to go about moving state-owned and operated facilities from the MDNR’s oversight to that of the proper local unit of government. Savings: $12,306,700. The MCCC program should be eliminated. This is a Depression-era program and a reincarnation of the 1930s “Tree Army” that took to the forests of America to create work clearing paths, digging ditches, and related activities. The MCCC employs some 200 recruits, ages 18 to 25, to spruce up state parks, clear trails and rake beaches. The state has survived without the MCCC, and it can again. 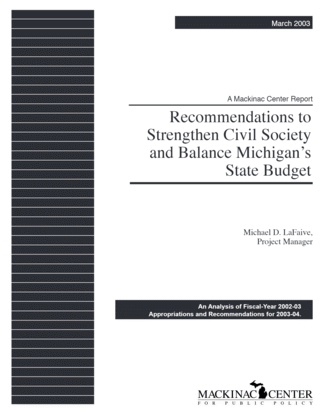 Budget constraints prompted Gov. John Engler to veto all funding for the program in 1991. Four years later, however, using proceeds from the sale of the state’s accident fund, the Legislature created a $20-million endowment to generate about a third of the MCCC’s current budget. Savings: $1,306,600.